NEW YORK, New York, November 1, 2012 (ENS) – Bruce Springsteen, Billy Joel, Jon Bon Jovi, Sting and Christina Aguilera will perform on a one-hour telethon Friday night to benefit Hurricane Sandy relief efforts. The telethon, “Hurricane Sandy: Coming Together,” will be held at 8 pm at NBC’s studios at 30 Rockefeller Center and hosted by Matt Lauer, the co-host of “Today.” Jimmy Fallon, the host of NBC’s “Late Night,” and Brian Williams, the anchor of “NBC Nightly News,” will also appear. NBC Universal said it will show the telethon and concert on its broadcast network and cable television stations. The telethon will be broadcast simultaneously on Bravo, CNBC, E!, G4, MSNBC, Style, Syfy and USA. Viewers can also tune in online at NBC.com. Non-NBC Universal networks also will be permitted to broadcast the event. Money raised will be donated to the American Red Cross to provide shelter, food, emotional support, and other help to the millions of people affected by the superstorm that hit the East coast on Monday night. While New York and New Jersey are slowly beginning to recover, millions of people are still without electricity, and wide stretches of are still flooded and uninhabitable. Four of the stars have a personal connection to places that the storm has damaged. Stringsteen and Bon Jovi are from New Jersey, while Joel grew up on Long Island and Aguilera is from Staten Island. 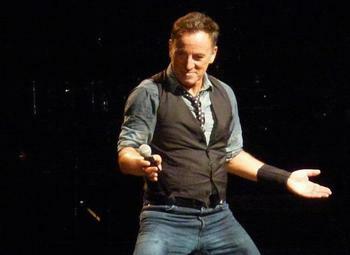 Wednesday night, at a concert postponed from Tuesday due to Hurricane Sandy, Bruce Springsteen and the E Street Band delivered a three-hour performance at Rochester’s Blue Cross Arena. “Tonight we carry a lot of sadness in our hearts,” Springsteen said as he introduced his song “My City of Ruins.” “This was originally a song about my adopted hometown struggling to get on its feet,” he said. Originally written for Asbury Park, the song helped many through the grieving and healing process after the tragic events of September 11, 2001. Now it comes full circle, as Springsteen sent “My City of Ruins” out to those down the shore recovering from the superstorm. “We’re gonna do this tonight from our hometown to your hometown. We’ll send this out to all the people working down there, the police officers, the firemen, and also to the governor, who has done such a hard job this past week,” Springsteen told the crowd. Bon Jovi hails from Perth Amboy, New Jersey and went to high school in Metuchen and Parlin, New Jersey. 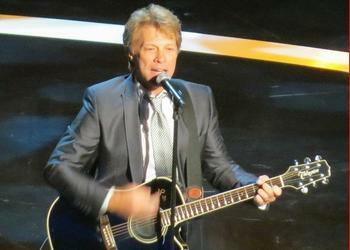 Bon Jovi has raised money for the American Red Cross and other charities in the past. He played as a part of the Live Earth concert at the Meadowlands in 2007, and he is one of 21 artists singing on “Everybody Hurts,” a charity single organized by American Idol judge Simon Cowell in aid of the 2010 earthquake that devastated Haiti. Joel was born in the Bronx and raised in Hicksville, New York, on Long Island. On March 22, 2011, as part of a fund raising event for impoverished children in the United States, Joel performed with some of today’s top teen artists. Aguilera was born in Staten Island, New York, the hardest hit of all the New York boroughs when superstorm Sandy blasted through the area. 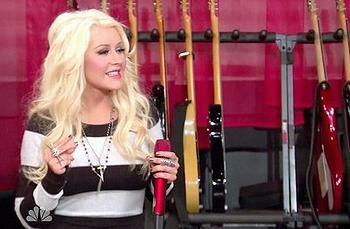 In 2010, Aguilera auctioned off tickets for her upcoming tour for Christie’s A Bid to Save the Earth. Proceeds benefited nonprofit environmental groups Conservation International, Oceana, Natural Resources Defense Council, and The Central Park Conservancy. Aguilera also supports Defenders of Wildlife, Missing Kids, National Alliance of Breast Cancer Organizations, Women’s Cancer Research Fund, and Cedars-Sinai Women’s Cancer Research Institute. In 2009, Aguilera became the global spokesperson for World Hunger Relief. The British artist Sting was born and raised in Newcastle upon Tyne, England. One of his homes is a New York City apartment. Sting has contributed his talents to many benefit concerns and founded the Rainforest Foundation to promote environmental conservation. The money the musicians raise will support the thousands of American Red Cross disaster workers, who are providing aid and comfort to people affected by Superstorm Sandy. Shelters are open across multiple states and feeding operations are ramping up as communities become accessible. “We know this is a very difficult and frustrating time for people who have lost their homes, are displaced or don’t have power,” said Charley Shimanski, senior vice president of disaster services for the Red Cross. 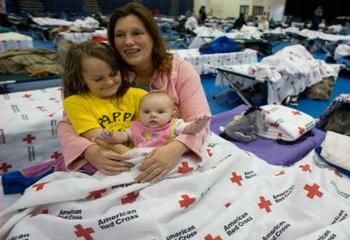 More than 7,000 people spent Wednesday night in 115 Red Cross shelters in nine states – New Jersey, New York, Pennsylvania, Connecticut, Rhode Island, Maryland, Delaware, West Virginia, Ohio, and the District of Columbia. Red Cross disaster workers have already served nearly 164,700 meals. More than 334,000 ready to eat meals are in the area and 12 mobile kitchens capable of making 198,000 meals a day have been deployed. Roads and airports are opening and more disaster workers, vehicles and relief supplies will be arriving in the stricken areas. The Red Cross has mobilized more than 3,300 disaster workers and more than two-thirds of the entire Red Cross fleet of response vehicles is beginning to distribute meals, water and snacks in some areas. Trailers full of relief supplies have also been deployed to help people as they begin to clean up their homes. The Mexican Red Cross is deploying 10 delegates to support American Red Cross health services activities in New York in the wake of the superstorm. The delegates will focus on providing health care and first aid services and referrals for clients in Red Cross shelters and emergency aid stations. This is not the first time the Mexican Red Cross has supported disaster operations, having deployed volunteers for Hurricane Katrina in 2005, the San Diego Wildfires in 2007, Hurricane Ike in 2008, and most recently Hurricane Isaac in September 2012. Nearly 360 Red Cross blood drives have been cancelled due to the storm, representing a loss of as many as 12,000 blood and platelet products. The Red Cross is asking people who are eligible, especially in places not affected by the storm, to schedule a blood donation now. People can make a financial donation in support of Red Cross Disaster Relief by visiting www.redcross.org, calling 1-800-RED CROSS (1-800-733-2767) or texting the word REDCROSS to 90999 to make a $10 donation. Contributions may also be sent to someone’s local Red Cross chapter or to the American Red Cross, P.O. Box 37243, Washington, DC 20013.